Scotland’s transport network is intrinsically linked to the development of the country, from military roads and bridges laid out in the 18th century to the canal and rail network which defined 19th century innovation. Many of these structures are feats of engineering using pioneering construction techniques and materials: our bridges and viaducts are industrial monuments. These structures form a dense network of interconnected routeways, superimposing the historic paths of medieval Scotland. In fact, many of our masonry bridges and viaducts are amongst the oldest structures in Scotland; they are a testimony to the durability of masonry and lime arch construction as well as the vision and tenacity of our forefathers. LTM’s respected masonry teams can tackle all types of masonry bridge conservation, from emergency repair works through to comprehensive repointing and embankment consolidation. 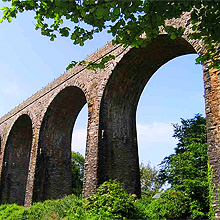 We have been involved in the repair of a number of bridges and viaducts over the years, thanks to our sound understanding of traditional masonry construction and the structural principles of the masonry arch. LTM Consultancy can also provide professional, technical advice on appropriate conservation practice, including mortar and stone analysis and repair specification. We can provide bespoke surveys to ascertain the condition of the masonry fabric and identify conservation solutions appropriate to the task at hand.